HE WENT UP ON HIGH! Responses to this series of blog posts on the Ascension have been a great encouragement to me. One blog reader enlightened me last week that every Ascension Day, some Amish communities across America circle their horses and wagons (literally) at someone’s farm, shutting down all activities for the entire day to focus exclusively on the meaning of Christ sitting down on heaven’s dais. Pretty cool! Also, a pastoral team on the West Coast, taking up the challenge from the last four blogs, summoned their active congregation to its very first “Ascension Day Celebration” service on Thursday evening, May 25. I secured a copy of the order of worship—it is fantastic! I promise I will share it with you in the final blog. Any church anywhere could replicate such a service with great benefit—doing so anytime (you don’t have to wait until Ascension Day 2018). Such responses encourage me to press on with this series. Please continue to send me feedback! Today’s blog installment begins with what may be the most egregious example of fake news ever perpetrated on American citizenry. The Apotheosis of George Washington—More Fake News! Recently I joined 300 USA Christian leaders for a prayer meeting under the Capitol rotunda. Above us, at the very apex of the dome, is a famous painting by the Italian artist Brumidi, placed there in 1865 (see a picture of it at the top of this blog post). 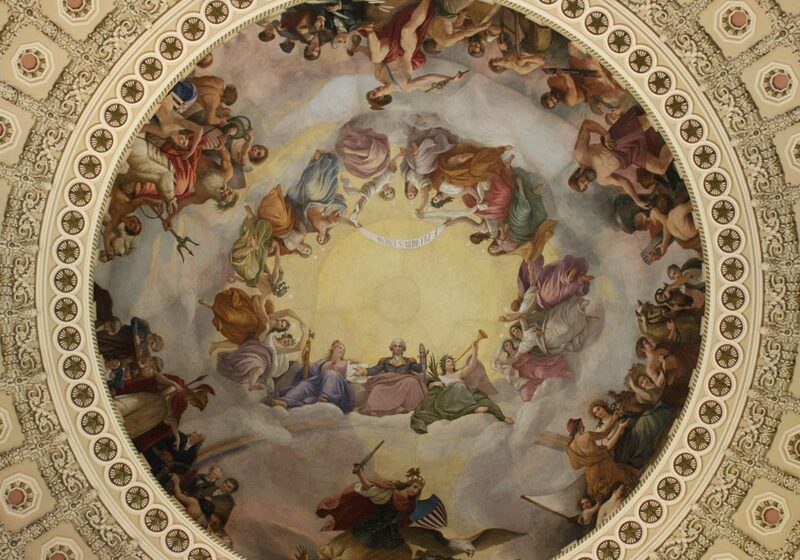 Titled “The Apotheosis of George Washington,” it shows our founding father exalted into the heavens, seated as a god, with a rainbow arch at his feet, flanked by the goddesses Victoria and Liberty. The banner in Latin above him translates to “Out of many, one,” a great gain because of George’s ascension, supposedly. The trouble is, as we all know, this event never happened! Surely if Washington had been around in 1865, he would have been the first to put a stop to it! George’s celestial gaze has looked down upon generations of important people and historical activities. Unfortunately, this painting of mythical history permanently dominates the chambers of our government. “Apotheosis” means “to be elevated to the highest position and given divine status.” During the beginning centuries of Christianity, most Roman emperors underwent “apotheosis” after they died (which is probably where Brumidi got the idea). That’s why the early Church’s proclamation that “Jesus the Christ is Lord of all” created such a widespread uproar and even severe persecution against their movement. The gospel of Christ’s salvific glory and exalted kingship flew in the face of a state religion that deified its rulers and solidified its empire by requiring universal worship of apotheosized Caesars. The battle lines were drawn. Believers could not worship a false god. The honors bestowed on God’s Son came about not as a way to evolve him into a deity but because he already is God the all-sufficient Savior. Everything and everyone is relocated under Jesus’ feet—emperors and any ruler in any age, including George Washington or any other American president. [Christ] was supreme in the beginning and—leading the resurrection parade—he is supreme in the end. From beginning to end he’s there, towering far above everything, everyone (Colossians 1, MSG, emphasis added).
. . . the same mighty power that raised Christ from the dead and seated him in the place of honor at God’s right hand in the heavenly realms . . . he is far above any ruler or authority or power or leader or anything else—not only in this world but also in the world to come. God has put all things under the authority of Christ (Ephesians 1, NLT, emphasis added). But in these last days, God has spoken to us through his Son. He is the one whom God appointed to receive all things . . . He uses his powerful word to hold all things together. He provided the way for people to be made pure from sin. Then he sat down at the right hand of the King, the Majesty in heaven. So he became higher than the angels. The name he received is more excellent than theirs (Hebrews 1, NIRV). Have you ever stopped to consider some of the gold medal honors bestowed on Jesus alone, in perpetuity, when he went up on high? Here’s one list to get you started. Biblical Acclaims for the Ascended Christ That Trump Even Trump! “Lord” defines Jesus’ rightful role of actively ruling over all. In fact, the Greek word translated “Lord” in the New Testament is the same word used to translate “Yahweh” in the Septuagint (Greek) Old Testament—pointing to the inherent deity of our Savior from eternity. He boldly wears the title “Lord of lords” on the day he returns to defeat all enemies (Revelation 19). “Jesus” (Jehovah saves) defines his rightful reputation as God in the flesh. The dust of earth presides on the throne of heaven! The same humanity, once fallen, to whom God said, “You are dust and to dust you must return,” is the same humanity, now resurrected in righteousness, to which God has said, “Sit at my right hand.” He is exalted as bone of our bone, flesh of our flesh. He’s above us, but he knows us because he’s one of us, who lived among us. “Christ” defines Jesus’ rightful rank. “Christ” means “anointed one.” God anointed Jesus as the only person able to fulfill all of Scripture’s purposes, promises, and prophecies. “Christ” is the New Testament’s code word reserved for the sovereign who would be found sufficient for our salvation. Today the role, the reputation, and the rank of our King are inseparable, thoroughly merged by how the New Testament addresses him as “the Lord Jesus Christ.” Jesus, who in the days of his flesh accomplished our salvation, now through his ascension has become the Christ, called to reign over all as Lord of heaven and earth. Scripture says Christ sat down at God’s “right hand.” That means he was invited to assume the loftiest place of recognition, as the one whom Heaven’s Court most highly esteemed—a position of greatest power and dominance. At the same time, sitting at the “right hand” now offers Jesus the deepest possible level of intimacy and engagement with the One filling the throne—where plans are formed, counsel taken, decisions made, judgments rendered, secrets shared, intercessions offered. Our Savior is not only a part of all that action, but he is also the start of all that action. In fact, he himself is at the heart of all that action. All of this is true because he was presented with the highest seat in the universe. Being “seated” at the right hand is a concept that refers to Christ’s official installment as King. This was our Savior’s irrevocable confirmation, his cosmic inauguration. When he sat down (Hebrews 1) that was the beginning of a coronation celebration that anticipated the final day when every knee will bow to him and every tongue confess aloud that Jesus is supreme, to the glory of God the Father (Philippians 2). When Jesus sat down at God’s right hand, he became automatically, permanently, and unconditionally the absolute Sovereign of heaven and earth, without restrictions, or reservations, or rivals. Accordingly, anything that is incompatible with his reign will be dethroned and is destined to be destroyed. Devils will be defeated and doomed. Strongholds against the gospel will come tumbling down. Equally, if not confessed, the rebellion (sin) of every human heart against him will be regarded as treason and dealt with accordingly. On the other hand, the surrender of every human heart in homage to him will be received and regaled as the adoration he rightfully deserves—joined with that of angelic hosts who bow before him. In one sense, Jesus’ ascension did not bestow on him a new title as “King of kings” (Revelation 19). No, as the second person of the Trinity that was already his citation from the beginning. Rather, his ascension and coronation became the prime revelation of his designation as King. Kingship extended not only to all he had created, but now also, for the first time, to all he had redeemed. He was not “made” King of kings when he sat down on high. Rather, the Ascension reversed Jesus’ humiliation by openly restoring to him his age-old role—but now on a much higher plane, with far more robust and far-reaching implications because of his incarnation, crucifixion, resurrection, and ascension. He returned to the throne bringing with him far more “royalty” than he had before—the additional measure of honor that could be bestowed on him only because he now rules over a thoroughly reconstituted dominion, a new creation, as its utterly majestic monarch. “I know that my redeemer lives,” declared Job. The first definition one dictionary gives for “redeemer” reads: “A title peculiarly applied to Jesus Christ. He redeems us from all evil by the payment of a ransom.” Even some academics realize this title belongs to Jesus in a most exclusive sense! To redeem is “to retrieve, then reclaim, then repossess, then restore.” No one but Jesus could do this—for each of us individually but ultimately for the entire creation (Romans 8). When we kneel at the name of Jesus and confess him as Lord, we magnify his matchless ministry to us as “Redeemer of Our Race,” which was totally fulfilled the day he entered the Holy Place with his own blood (discussed by the entire book of Hebrews). Exalted, he is no longer subjected to the sin and brokenness of a fallen world. Exalted, he has been raised above the weaknesses he once knew, the evil that once hounded him, the forces of darkness that once badgered and betrayed him. But the good news is this: He takes all of his followers with him into his final triumphs—which is how we end up redeemed! Christ also suffered once for sins . . . He suffered to bring you to God . . . He has gone into heaven. He is at God’s right hand. Angels, authorities and powers are under his control (1 Peter 3, NIRV). Jesus is lifted up and we are freed up! Just as in God’s eyes we died with him, were buried with him, and raised from the dead with him, even so, right now, God sees us as those who have ascended with him to share in his righteous regime. We are slaves to sin, Satan, and sepulchers no longer! Jesus was the first human to ever be physically awarded unrestricted entrance into heaven—undying, unashamed, and unhindered—directly and instantly by his own name, based on his own fame. Therefore, he is our forerunner. He has gone ahead of us and prepared the way for us to follow in his steps—to the place where one day we will join him to serve fully under his vast jurisdiction. Here is what I will do for anyone who has victory over sin. I will give that person the right to sit with me on my throne. In the same way, I had victory. Then I sat down with my Father on his throne (Revelation 3, NIRV). Jesus lives forever. So he always holds the office of priest. People now come to God through him. And he is able to save them completely and for all time. Jesus lives forever. He prays for them. A high priest like that really meets our need. He is holy, pure and without blame. He isn’t like other people. He does not sin. He is lifted high above the heavens (Hebrews 7, NIRV). What high honor this is! Talk about a “cosmic celebrity”! The explosive nature of Jesus’ ascension turned everything upside down—a feat of Olympic proportions, worthy of every victor’s wreath ever given—combined. Mary’s little boy has become her blessed Lord. David’s greater son has taken over his throne forever. The servant of Israel has become the sovereign that saints long to serve. The disciples’ rabbi who washed their feet has become their ruler at whose feet we all fall. The healer who bent over to lift up the poor and paralyzed has himself been lifted up to heaven to enrich and liberate the universe. The man of sorrows who was rejected by men has become the message of songs rising from the redeemed. The victim has been transformed into the victor. The wounded peasant executed by Roman soldiers is now acclaimed as the undefeated warrior who is supreme over all. The agonies of Mount Calvary have been replaced with the adulations of Mount Zion (Hebrews 12). “Old things have passed away; behold, all things have become new!” proclaims 2 Corinthians 5, NKJV). Why Not Host an Awards Ceremony in Your Heart? Just looking over this “starter list” it is clear that right now God’s Son should be crowned with the maximum number of superlative accolades we can give him, in a way that reflects how he occupies first place in the universe. You have been raised up with Christ. So think about things that are in heaven. That is where Christ is. He is sitting at God’s right hand. Think about things that are in heaven. Don’t think about things that are only on earth. You died. Now your life is hidden with Christ in God. Christ is your life. When he appears again, you also will appear with him in heaven’s glory (Colossians 3, NIRV). But in your hearts set Christ apart as holy and acknowledge Him as Lord. Always be ready to give a logical defense to anyone who asks you to account for the hope that is in you . . . (1 Peter 3, Amplified Bible, emphasis added). Just as he rules over potentates and presidents, let Jesus trump everything in your domain as well. Reward him with the highest praise and worship and adoration that he alone deserves for the travail of his soul for your life (Isaiah 53). He is worthy of nothing less.